Wooster and Mercer Lofts Condominium in 2 sentences: Wooster Mercer is a luxury community consisting of one and two-level loft layouts that have open floor plans, large windows, and upscale finishes. 17-foot ceilings, over-sized windows, and private rooftop patios are just some of the many features that make Wooster Mercer some of the most sought-after condos in Arlington. The Wooster and Mercer Lofts community is a luxurious condominium located at the edge of Rosslyn along Clarendon Boulevard. The community is made of twin buildings; The Wooster is located at 1600 Clarendon Boulevard, and The Mercer is located right behind it at 1615 N Queen Street. The buildings are separated by an outdoor courtyard and pool. The buildings’ sleek exteriors are distinctive and feature a copious amount of windows parlayed with a contemporary design. When it comes to Rosslyn luxury condos, Wooster and Mercer is in the upper echelon of the condo market. The community was built in 2007 by Abdo Development. 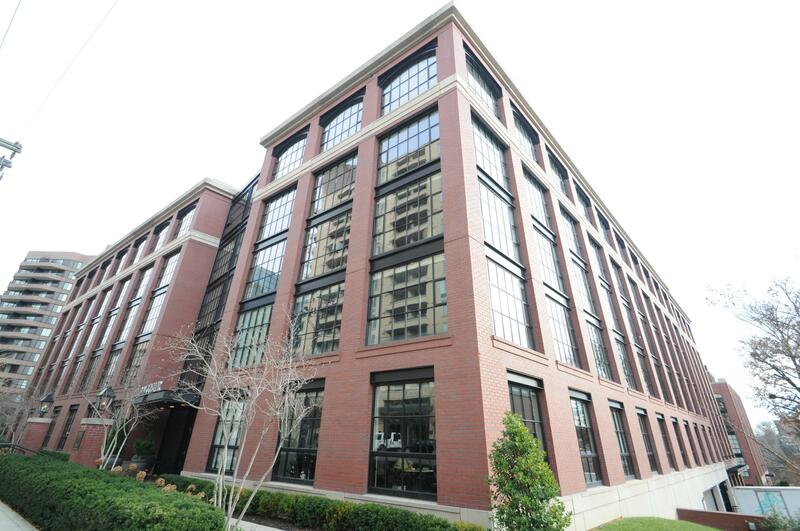 Abdo builds most of their communities in D.C., but came out to Virginia and built Wooster Mercer Lofts, as well as Wooster Mercer’s lavish neighbor, Gaslight Square. The communities will share a lot of the same upscale qualities. The Wooster will contain about two-thirds of the condos in the community, while The Mercer building will house the remaining third. Loft units for sale in Arlington are difficult to come by which is why there is almost a pent-up demand for an upscale community like Wooster Mercer. The community is made up of studios, one-bedroom, two-bedroom, and even three-bedroom floor plans. Layouts could be one level, but many of them are indeed of the two level, loft style. The mindset behind floor plans at Wooster Mercer is to open up the interior, create a dynamic living area, and to emulate that of a New York SoHo loft style residence. One-level residences will have 10-foot ceilings, while two-story units will have either 17-foot, or 21-foot ceilings. Abdo took advantage of having higher ceilings by putting in mostly floor-to-ceiling windows. The result is dramatic living areas perfect for entertaining or for those tired of cookie cutter units. In addition to high ceilings, and lots of natural light that infiltrates the living area, other common themes include exposed brick, exposed duct work, outdoor terraces, and either a floating staircase or a spiral staircase for those privileged enough to acquire a two-level residence. Floor plans at Wooster Mercer will start at about 700 square feet for studios, 1,200 square feet for one bedrooms, at least 1,500 square feet for two bedrooms, and the rare three bedrooms will clock in around 3,000 square feet. The most common layouts to find are the one and two-bedroom floor plans. The amenities at Wooster and Mercer offer residents a tremendous amount of value for the lower condo fee that owners pay. Residents enjoy concierge, a fitness center, a community room, and an outdoor pool. When compared to Turnberry Tower or The Odyssey, the fees are much lower, but it should be noted that the value you are getting at the latter communities may be more than you are receiving at Wooster Mercer Lofts. Although situated on a main thoroughfare in Arlington, residents of Wooster and Mercer enjoy a private lifestyle. With less than 100 residences split up into two different buildings, the community is significantly smaller than other luxury condominiums. Residents also enjoy living in a community that features unique designs that can only be found within the community and across the street at Gaslight Square. Loft units in Arlington are extremely rare and Abdo has come in nicely and supplied opulent options that the market was in dire need of. One potential downside of living at Wooster Mercer is the proximity to Metro. If distance to Metro is a high priority, then there may be better living options available in Turnberry, The Waterview, or even The Atrium. You will not be able to replicate the loft feel or the ambiance, but these three condos are in the higher end of the market and a bit closer to the Metro. Wooster and Mercer is located at the ‘entrance’ to Rosslyn as opposed to the ‘downtown’ area of Rosslyn that most are accustomed to. The community is a nine minute walk to the Rosslyn station. All things considered, the walk is a very short stroll, but there are options that are closer to the Metro if this is a deal-breaker. Condos at Wooster and Mercer Lofts do not come available too often. It is a smaller, boutique community with good amenities and an ambiance where residents can keep a low profile. The designer finishes throughout the residences make it one of the nicest communities in the area. The loft style gives the community some character that, excluding Gaslight Square, cannot be found elsewhere. Location, ambiance, and value put Wooster Mercer among the top condos in Arlington and in the Washington metropolitan area.